Today has, despite what you might think from the image above been a good day. It started in much the same way yesterday was all day, with pouring rain. Now, living in a caravan during a rainstorm is much less terrible than living in a tent for obvious reasons. The only drawbacks are really that it becomes difficult to prepare hot meals and our caravan lacks a toilet. As we are in Australia however, the rain is not cold – which is nice but hard to get used to. After about a movie and a half, the rain stopped and we were tasked with taking a months worth of rubbish to the tip, which also is quite an experience down under, compared to the way we do it in Sweden. Before we got to the tip however, we blew a tyre on the car, and that explained why it’s been bouncing so weirdly for the past couple of weeks. The main difference between te do recycling in Sweden and the way it’s done over here is simple. In Sweden, reclycling is recycling. You put your plastic bottles with the plastic bottles, the soda cans with the soda cans, and so it goes. Down here, however – recycling works like this. Everything that is recyclable (haven’t really gotten the hang of what is yet) goes in the same bag and then in one big container. After that it seems a bit fuzzy, but I hope they process it somehow. I’m not sure if I’m hoping for rain tomorrow or not as the alternative is extremely hot and extremely humid air that can incapasitate the most energetig of souls. It is time for yet another update regarding our status over here. After spending last saturday pouring concrete into what would then become the new back yard, we were informed that the happy new tenants for the downstairs unit would indeed be us. This despite the fact there had been quite a few others placing bids, because that is how it works down here. If you are interested in renting something and others are interested, people apparently do the following; offer to pay extra rent, offer to stay longer, offer to pay several weeks rent up front. What I’d recommend though is to get to know the landlord and help out with stuff. Along with renting a place for a longer period of time however comes the need for a job and there are quite a few questions surrounding that subject, most of which are yet a mystery to me. I have so far applied to a few jobs on gumtree, and was at an interview this morning, which in itself was an experience as English is my second language. The interview being made in a group however, and the position apparently being as a phone salesman made it clear quite quickly that it wasn’t really the job for me. A thought worth thinking is that I should perhaps pick up the hammer once again and resume carpentry for a while. To be eligeble for work in construction in Australia however, you need get yourself a white card. These are different in each state and costs between 50-100 dollars a pop, depending on if you do them online or in person. 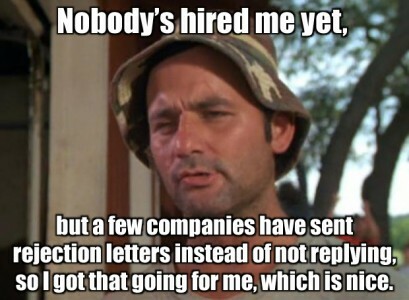 Doing one in person should have the benefit of possibly getting in contact with someone hiring. That’s enough rambling for today! P.S. 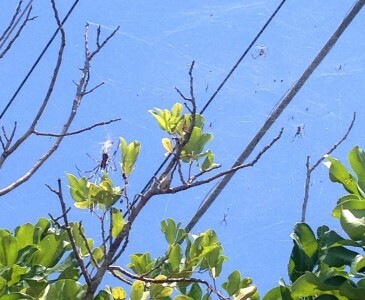 The spiders in the picture are residing in the tree just outside our caravan and I believe the big one (to the left (about 10cm)) is some kind of Orb Spider, probably a female surrounded by a bunch of males as per usual. One thing I was quite worried about when thinking about the adventure in Australia.. 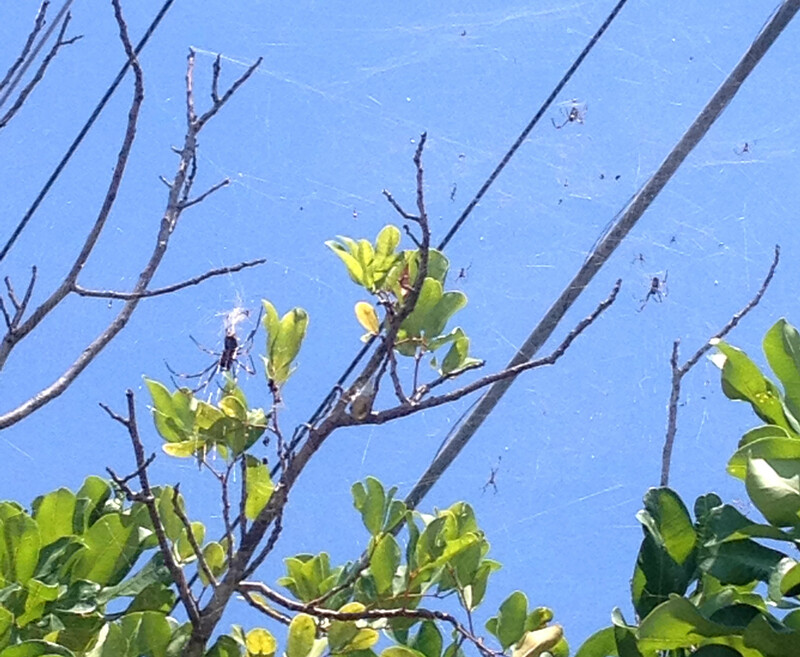 It wasn’t the snakes, the spiders, the sharks or the drop bears, no it was the heat. The daytime temperature in some (coastal!) cities around Australia right now is at 44 degrees celsius. In Brisbane today, we’ve only had 30 but that is quite enough. 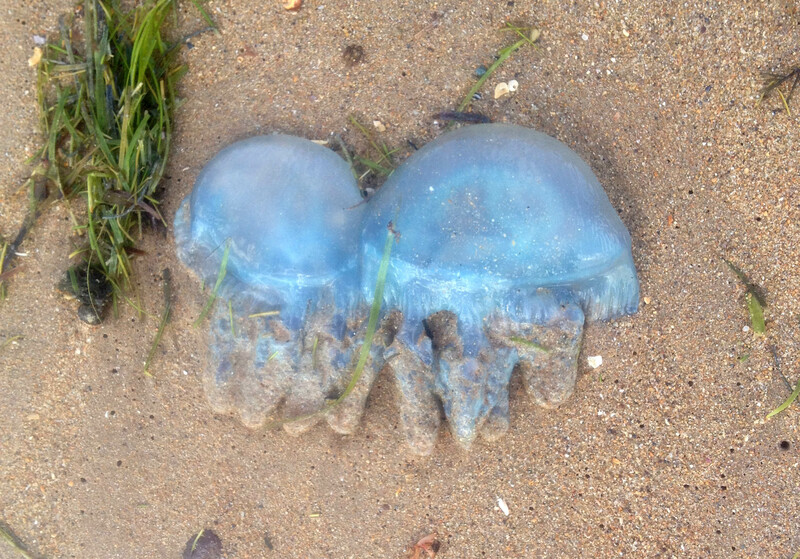 I started my day with a nice long walk along the beach where I saw these happy-old-couple-looking Blue Blubber Jellyfish – this was around 7AM and so it was still kind of comfortable, but later on I just ended up lying in the caravan feeling like I was going to melt through the floor. Being a Swede, this is supposed to be considered a pleasant problem in early January but I’m not so sure I agree. I’m starting to miss the layers and layers of winter clothing, the wooly hats and fluffy socks. You see, the benefit of a cold climate is that you can always put on more clothes to make it more comfortable. When it get’s too hot, you can only undress to a certain point. That being said, I can’t claim not to be enjoying the morning walks in the soft sand by the cuddly jellyfish. If you want to play with them, the trick to not being stung is to simply not touch the tentacles – especially the insides of the tentacles, because though they are not considered deadly to humans, they hurt quite a bit. Even after they’re dead. Because that’s what harmless animals are like in Australia – they will hurt you even after they are dead. Just thought I’d share this VLOG made during the journey from Orange to Port Macquire and give you an update on our new status. This morning, we left Manly and went a bit north to Redcliffe, which is (I think) also a suburb of Brisbane. Our ambition is to rent a unit in a house near by the beach. We found the ad for the place on gumtree just as we arrived in Manly and once there for an inspection, we did what we Swedes do best – We helped build stuff, and was offered a free dinner and to spend the night in the caravan joust outside the main building. The next day, there were some more work to be done and we offered to help. In return, we are to get free accommodation in the caravan (though for an unspecified ammount of time.) Hopefully this will put us on top of the list of possible tenants! Renting a unit, or an apartment or a house for that matter in Australia is quite different from the systems we use in Sweden. In Australia, almost all places for rent are owned by ordinary people, contrary to Sweden where bigger organisations usually have the ownership of the apartment buildings. This, I suppose can be both good and bad as the rent is not in any way regulated down here. This place for instance is 275 AUD per week (6900 SEK). It is however 70 meters from the beach and all bills are included. We have now successfully arrived in Manly, just east of Brisbane after a couple of hours on the not so entertaining pacific highway. At least it isn’t if you’re on a motorbike. Brisbane is famous for being the capital of Queensland, which in turn is a state famous for not applying daylight savings. This is quite weird. From what I hear it gets even worse when you travel to the Northern Territory, because in the rural areas, they haven’t really decided on what time zone is valid, so you just pick one and stick with it. I’m guessing meetings and schedules are not a big thing up there. After spending some time on various beaches by the fantasticly hot water, we have decided that Brisbane is the place to stay, so we’re currently looking for a house or an apartment to rent and thereby possibly gaining a home away from home. 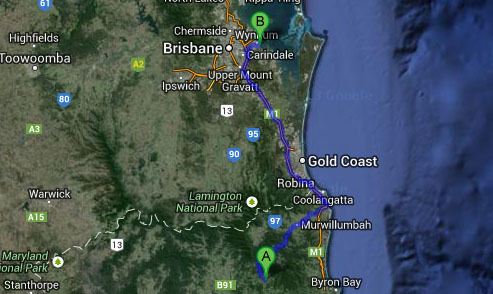 Some road information for bikers; The road from Nimbin and pretty much all the way down to the Pacific Highway is truly amazing, with thousands of curves and bends that will make you smile. It goes on for miles and miles! Felix and David had decided that they wanted to leave Orange and we hadn’t been talking alot so the plan was for them to go by themselves. After a quick chat however, we decided to keep sticking together for a bit longer and that’s what we have done. On tuesday morning therefor, we packed our bags and got going inland. For me, alone on the bike this was quite an adventure, especially since I soon realised that my carrier gave me zero reception when travelling inland. The first day, we went from Orange, through rural Australia and many minor cities that seemed to just recently have introduced color TV, heading towards Port Macquire where we were to spend the night. 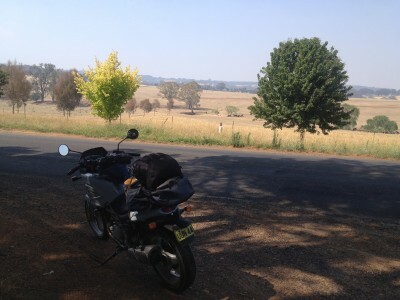 The rural roads were fantastic for a motorbike with many curves and a marvellous scenery wherever you went. The landscape went from a desertlike country to green forrests, to big hills and finally to wet tropical landscape as we neared the coast. 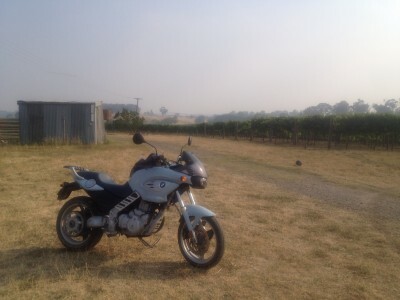 Some time around 10PM we arrived at the vineyard and were told that we could spend the night, which was much appreciated. We went to sleep and continued the journey the next day after a quick visit to the beach, heading up to Nimbin and Byron Bay. Day 2 of the journey was both better and worse for two reasons. Better because I could keep my bags in the car, lightening the load on the bike, and we didn’t have to go as far. Worse because the rain was pouring down at times, making it hard to see through the visir of my helmet. 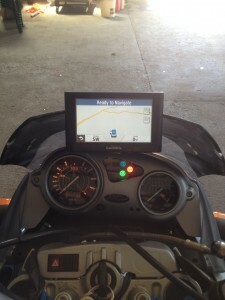 This also made me fall in love with the heated grips on my handlebars. Without them, the journey would have been far more uncomfortable. The warnings I’ve gotten regarding the roads down here mostly concern that they get extremely slippery when wet. That turned out not to be a problem however, but I suppose it may depend a bit on your speed. Mine was quite slow on the wet bits, and when stopping completely I could feel the ABS kicking in a bit. 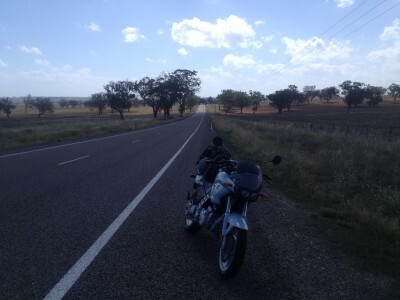 Once clear of the rain, I was expensively introduced to the laws of the road in Australia. 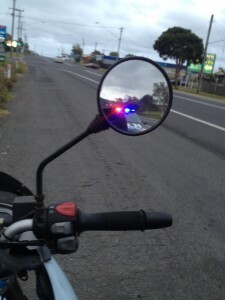 Short story – it costs 167 AUD to overtake a vehicle on the left side and if you hold an Australian drivers license, it takes ”two points of your license”, whatever that means. Last night, we arrived at the hippiest hostel I have ever seen up in Nimbin and we’re planning to stay here for a couple of days before moving closer to the coast again. Vlog from our brief stop in Flynn Beach in Port Macquire. It is according to the locals the best beach in town and yet the water was cold by Australian standards. Finally my best ride video so far has been uploaded and is ready for your enjoyment. The ride goes from Orange Backpacker, where we are staying right now and up to the top of Mount Canobolas which is approxamately 14k’s away. Most of the road is amazingly curvy and it is hard to go over the speedlimit in the curviest bits. If you want to do this very same ride, you can find the start and goal here. Just beware that parts of the road are gravel! We have now spent three weeks (or is it four? or an eternity?) living in a tent in rural Australia and it has certainly put a strain on the way we three act around eachother. It may be common when travelling three people together that conversations are more commonly held between two people and thence one gets sort of left behind. Especially if the third person is a dominant know-it-all without much interest in some of the things the first two people enjoy. 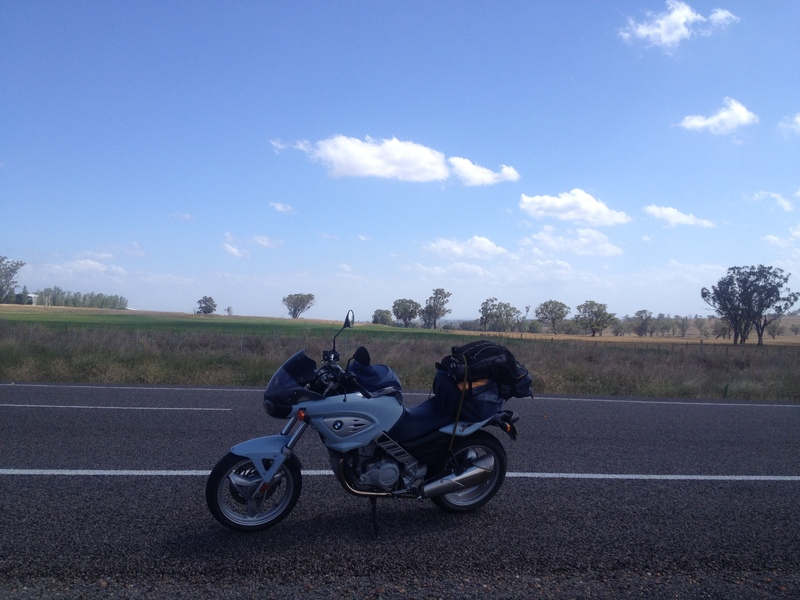 I must therefor suggest to anyone going backpacking to make sure you are able to go on by yourself if the need should arise – I have not done so, but am currently working on getting panniers and straps to get all of my stuff onto the motorbike. Possibly also getting a tent and some kind of miniature stove to be able to make my own meals, as hostels are expensive when you don’t have a job. I believe the super-combo of living so closely together combined with the tragedy of me running out of Snus (fantastic Swedish nicotine solution) has made the strain between me and the other two a bit too much to handle. Felix and David have decided that they want to go woofing (working for food and shelter) whereas I like money and want to go diving by the coast, so by the looks of it, we are about to split up and make me a party of one. Starting last night, the wind has been quite severe, hence the topic. Oh, and I created a new mount for my GPS this morning – hence the picture.